Female Psychopaths - Smear Campaigns, Bullying, Flattery, Lovebombing, High Testosterone and Self Pity by Thomas Sheridan BPD was invented as a drug treatment programme. That's it. They had some new drugs and needed some made up "conditions" to boost sales. In other words big pharma in colusion with psychiatrists made it up. Good for business. What makes this BPD even more absurd is there have been no empirical or clinical evalutions done to test the validity of the diagnosis. If you look at what it is - nearly all the same sympthoms are psychopathic behaviour. Just another rebrading to sell drugs. 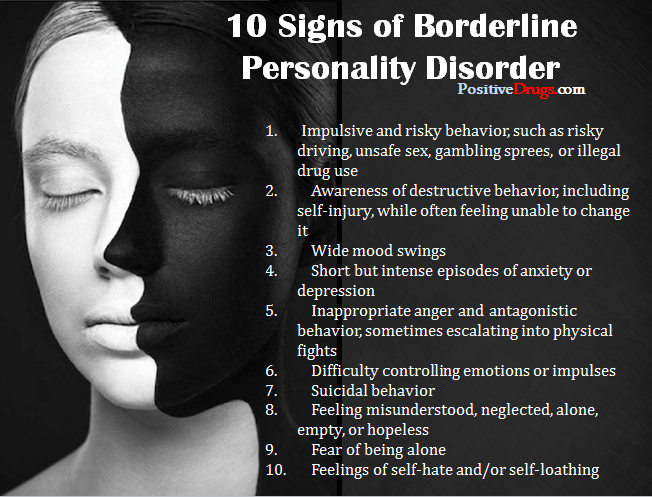 Now what is really sickening is that the concept of a drug or treatment for BPD gives victims living with psychopaths now rebranded as "Borderline" a false hope of a "cure" while also the label is being applied to people who are non psychopathic and may just have emotional problems. It is a social timebomb if you ask me. One of the reasons why the stats of male v female psychopaths are so skewed is that most female psychopaths are being diagnosed as BPD rather than as psychopaths. This also allows them lenient treatment in courts on the basis that they can be medicated out of their pathology. Psychopathy/sociopathy is a pathology that is VERY easy to confirm. We have excellent diagnostic tools coupled with CAT scan technology which give a 100% spot on confirmation - no guess work. It is perhaps the most easily determined metal disorder of all. Yet more and more of these predators are being tagged as BPD and being allowed a free ticket to hunt at will. If they get caught. They can be "cured". A complete disaster in every way except for the psychopaths. [vid] Stepford Wives / Replaced Stars / Clones / Synthetic Androids Cloned beings have a psychological cut-off point that will manifest a intense dis-connection of their mind and body and this will create BPD ("Borderline personality disorder") since their first birthday. They are able to think, but cloned beings are not working via six-helix bundles of DNA. Clones work with less than five-helix bundles and you people may know that more than six-helix bundles of DNA are necessary to get full awareness and all higher features that we all are looking for. So a clone is a artificial lifeform that lives in the - extremly limited - genetic cave of his creator(s). They are absolutly defenseless. From the Garden by Cassie The most common personality disorders associated with the "bad reptilians" are Narcissistic Personality Disorder, Anti-social Personality Disorder, and Borderline Personality Disorder, or a combination of any of these. Valerie Wolf, M.S.W. New Orleans Presentation at Believe the Children Conference, Chicago - April 1997 Borderline Personality Disorder I consider to be a perfect description of survivor behavior. If you look in the DSM what you will see is everything we talke about is characteristics of sexual abuse. When I treat it like that it's much easier, I don't get frustrated with all this "borderline" behavior. ......Borderline, as I said, are people who are shallow, frequently move from relationship to relationship, have very intense relationships with the therapist but really fear intimacy.